Here’s a telling sign of a memorable golf trip: you start dreaming about it long after your return. And the subconscious tug is not due to losing your passport or wallet. No, only pleasant dreams abound with friendly faces and gestures, scenic landscapes and soul-stirring golf. For me, they speak of Ireland. It was a year ago when my spouse Deb and I began planning our overseas trip. Both of us had traveled to Ireland on several occasions, the first time being in 1985 when we scoured the Emerald Isle from east to west, south to north and parts in between. On this occasion, we were determined to trace some of our Irish history while partaking, naturally, in that old game with fourteen implements. In short, the theme was family links meet golf links. After landing in Shannon, we were driven to Ennis, the first stop on our family history pilgrimage. Known for its Irish music, Ennis is a delightful, picturesque and stroll-friendly town. And it’s well-located for some of our planned local forays into the past. After catching a nap, we visited Kildysart, aka Fisherman’s Haven, where Deb’s great-great grandfather was born in 1812 and lived until 1842 when he emigrated to the U.S. On a clear and sunny day, we couldn’t have been more pleased with our start. The next day our ambitious itinerary took us through three Irish counties visiting the villages of Doonaha, Carrigaholt and Lorrha. All with connections to Deb’s relatives, we visited churches, farms, abbeys, monasteries, beaches and graveyards. On the surface, such stops may seem snoozy but through the eyes of a determined family detective it’s an uplifting adventure. And trust me, I wasn’t even sampling the Guinness. A particular highlight was a fascinating tour of Lorrha given by James Heenan of the local historical society with whom Deb had corresponded. Remotely located on the northern tip of County Tipperary, Lorrha exudes the Irish past and ancient ways marked by Druids, saints, scholars, monks, Viking raids, Norman settlements and Cromwellian onslaughts. This small village seemed to encapsulate Ireland’s rich and varied past like no other: inspiring, timeless and authentically preserved in the most humble of settings. Galway is thriving, young, eclectic and bustling—known as Ireland’s oldest city on the wild Atlantic way. It doesn’t disappoint. Especially when our visit began with lunch with Michael, one of Deb’s second cousins who kindly took the bus down from Ballina, located two hours north in County Mayo, to meet us in the city. (Note to golfers: Ballina is 15 minutes from Enniscrone Golf Links, an admired links course.) Family stories were dusted off and shared, local and regional history explained and connections retraced. And this time, a pint or two of Guinness was implicated in the proceedings. We later explored Galway on foot and marveled at all it had to offer: museums, pedestrian-only and fashionable shopping areas, seaside promenades, street musicians and chic bistros, raucous pubs, the last stone cathedral built in Europe, and the National University of Ireland Galway. On this last note, we loved touring the campus and its Tudor Gothic buildings, modeled on Christ Church at Oxford. On a warm and sun-splashed day, the students gathered on lawns and in outdoor cafes. Rigorous studies were placed on hold as were our domestic cares and worries. It may seem fuddy-duddy to some but we occasionally favor a guided bus tour as a part of our travel itineraries. You just can’t beat it for convenience, stress reduction and educational value. That’s why we booked a Connemara Day Tour with Lally Tours. Besides, you always meet some friendly and interesting people along the way, like the young woman on holiday whose business is selling terrorism insurance to large multinationals. And she talked about it with such a smile! Driven and narrated expertly by ex-military officer Michael, the tour of the Connemara area was stunningly beautiful with the added bonus of dry, sunny skies. 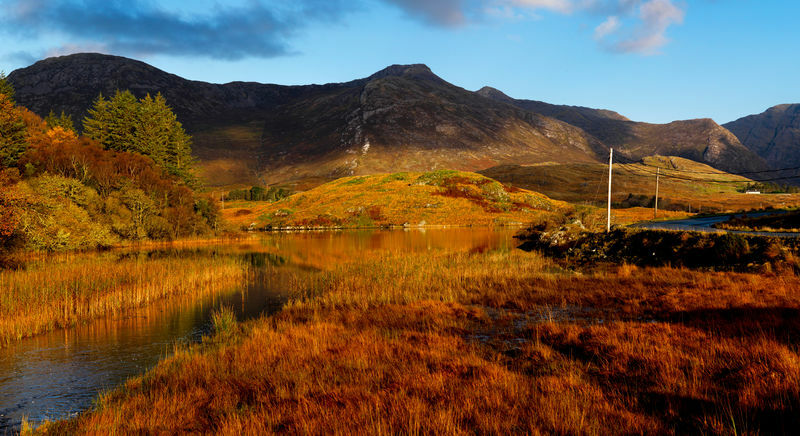 Off the incessant grid and far from cell towers, Connemara embraces and celebrates the traditional Irish life in the rural and unspoiled regions of the West. Along with breathtaking views of mountains and lakes and a stop at Ireland’s only fjord, there’s a visit to Kylemore Castle & Abbey. Akin to the lavish grandeur to Asheville’s famed Biltmore Estate, the Castle— with its 70 rooms— took four years to build and opened in 1871. Golf: Links lovers will relish Lahinch GC, a 35-minute drive from Ennis. It’s a classic layout opened in 1892—originally laid out by Old Tom Morris for one pound plus expenses—overhauled by pro Charles Gibson in 1907, and then with a major renovation in 1927 by famed architect Alister Mackenzie. It’s a must golf stop on anyone’s journey to western Ireland. For those favoring parkland and scenic bucolic settings, Portumna Golf Club is highly recommended—about an hour drive from both Ennis and Galway. Founded in 1913, it’s a popular choice for its undulating fairways, excellent course conditions, woodsy environs and value pricing. And its restaurant is one of the best in the region. 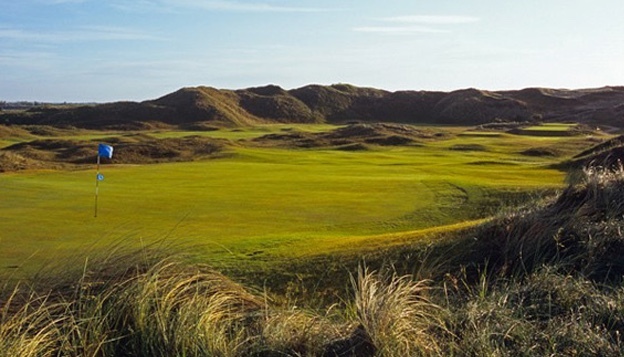 In the Galway area, a visit to Connemara Golf Links, designed as a community project by the inestimable Eddie Hackett, pays rich dividends. It’s a wonder as to how Hackett conceived this worthy playing experience amid such a rock-strewn landscape. But it all fits perfectly, like a melody to a lyric in a favorite Irish song. Hotels: The Old Ground Hotel in Ennis was a smart choice for its convenient location, delicious food and energetic service (the owner was ever present and busy, meeting guest and hotel needs). In Galway, we stayed at The g Hotel (small g is not a typo), the city’s only five-star property that’s distinctive for its decor and design, cuisine and Espa, its award-winning luxury spa. Arriving in a relaxed mood by train from Galway, we were eager to tackle Dublin, now one of Europe’s most thriving and popular capitals. In 1985 when we visited the city it lacked a certain spark, big-city attributes and cosmopolitan allure. (Of course, the same could’ve been said about us!) But wow has that changed. Dublin is bustling, young, smart, diverse—ever lively in the arts, business, shopping, dining, and nightlife. For an unhurried overview of Dublin, we opted for the “Hop on Hop off” city bus tour. Later, we enjoyed just strolling around this compact city with its rich and storied history as well as a visit to the fine National Museum. Although the choices for a visitor’s time are endless, the city itself remains manageable, not daunting. Following dinner at our hotel, we had a delightful time at O’Donoghue’s Bar savoring its traditional Irish music, singing along on a few well-known favorites with new-found friends from Europe and the U.S. It was one of the highlights of our holiday. While I was playing golf (more on that later), the next morning Deb took a stimulating three-hour guided walking tour by a firm established by Pat Ruddy, a renowned author, local historian and artist. Led by the friendly and knowledgeable Darragh, the tour expertly touched upon many aspects of Dublin’s history and culture, many of which touched upon our family heritage. That evening we took in a play at the famed Abbey Theatre. Showing was the iconic “Waiting for Godot,” the sparsely staged and tersely written masterpiece by Samuel Beckett, the Nobel prize winning Irish author. I first read the play back in college and was enthralled then by its difficult yet universal themes about language, meaning, and loss. This faithful and deft Druid Production was marked by exceptional performances that kept the packed house keenly focused and aware, despite its bizarre and confounding narrative. Being a part of this appreciative Dublin audience was a special treat. It should be noted here that no relatives were visited in Dublin. In ’85, we had dinner with some distant cousins but they’re both long gone. Over the years through letters and emails, Deb has made good use of Dublin’s National Archives of Ireland in fleshing out our family tree. It’s a vital resource for genealogists and family historians. Golf: Only the world’s biggest sourpusses will leave Portmarnock Golf Club, founded in 1894, with a frown about their round. An esteemed links club ten miles north of Dublin, it’s hosted a slew of championships. On the morning of my memorable round, I was paired up Brad, a fellow American and a fine senior player from California. It was Brad’s first trip to Ireland and this was his inaugural game. Well-guided by our caddie, an aspiring European Tour professional, we both struck the ball well and were buoyed by the spirit of links golf. The turf was firm and fast and the greens were smooth. With fairways set low in the flat dunes land, views of the sea are limited unlike many links layouts. However, I did note that on the demanding par-four 4th hole, the card’s no. 1 index, a row of trees lining the seaside of the fairway had been recently removed, thus exposing a better view of the shoreline and water. 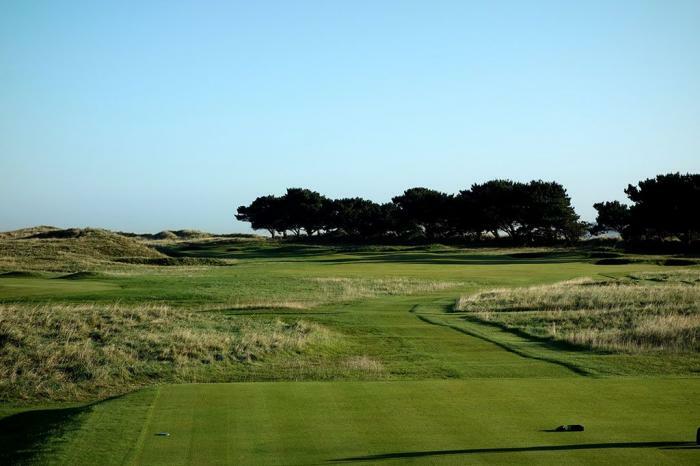 To sum up Portmarnock, I favor this 1902 quote from World Golf Hall of Fame British amateur Harold Hilton: “Its charm is difficult to describe. There is little sign of artificiality and it is one of most natural links in the world.” Nailed it. Hotel: The Fitzwilliam Hotel exceeded all our expectations. Centrally located near fashionable and busy Grafton Street and across from St. Stephen’s Green (the city’s main square), the Fitzwilliam is a five-star property that’s earned some of the top domestic and international travel awards, most notably by TripAdvisor, the all-telling consumer website. We joined the chorus of pampered and satisfied guests and particularly savored the dining and ambience of Citron, the elegantly yet minimalist-designed restaurant neatly located on the mezzanine above the lobby. The village of Malahide, only a short drive from the Dublin airport and situated along the Irish Sea, was selected for the final spot on our Irish itinerary. Over the years, friends and savvy travelers alike have stayed here as either the first or last stop on their overseas golf adventure. In many ways, Malahide is a model Irish village, offering a town center, a beautiful and expansive park, seaside views and paths, golf courses, tennis courts, and many good restaurants and pubs. Despite its proximity to Dublin—or maybe because of it—it has managed to maintain its cozy charm. As we were headed to an early dinner one evening at the Greedy Goose (highly recommended) which overlooks the marina, we watched a class of school children lining up on a dock for a kayak lesson. Donning bright yellow life jackets, they entered into their vessels like obedient tiny ducks following their large-feathered parents. The whole scene embodied the lasting appeal of Malahide and its less noisy and simpler essence. Golf: The Island Club has been on my personal bucket list for a long time. From my hotel, I could see the course across the estuary but short of swimming there was no way to get there. For almost a century, the course’s sole access was by a boat from Malahide with its oarsmen doubling as greenkeepers. In its early days as an invitation-only club seeking members from Dublin’s “best circles,” The Island’s isolation was part of its allure. Today, a winding road takes panting golfers to the club’s entrance but due to the topography, it still takes 25 minutes. Immediately on arrival, one is struck by the wild dunes land and the stiff wind whipping the flag in starched salute. As a trusted guide and congenial playing companion, John Lawlor, the general manager of the club, was kind enough to join me. Coincidentally, John grew up and now lives in Malahide only a “drive and a six-iron” from the club but because of the estuary “couldn’t get there.” An astute and cogent observer of what makes a club successful for members and visitors alike, John provided me with a wealth of insight and information. The playing experience was a joy, compounded by a day of pleasant, dry weather and tamed winds. Unlike some celebrated links course, the Island has ample fairway space on most of its holes so even with the usual constant wind it remained playable. On so many levels, The Island is a rewarding experience. It’s not surprising to learn how the best American and European golf travel companies now include it among its premier links’ itineraries. Let me echo and second this motion voiced by John when asked what first-timers think about The Island Club: “Visitors come away knowing they’d play a course on a par with the rest of the celebrated links courses in Ireland.” Amen! Hotel: Malahide’s Grand Hotel was a perfect choice. Situated along the estuary, it’s a full-service conference hotel, ideal for strolls along the water and with easy access to the village’s restaurants, pubs and shops. It afforded a quiet and restful sleep on the eve of our bittersweet departure. When we awoke and prepared to head to the airport, we felt enriched and grateful for such an inspiring, snafu-free week in Ireland. But maybe we were still dreaming.